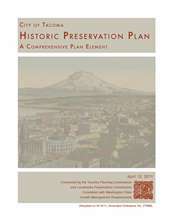 The regulations that govern historic preservation activities in Tacoma appear in various sections of the Municipal Code, including Title 1 (Administration – composition, powers and duties of the Landmarks Preservation Commission), Title 8 (Public Safety – historic property maintenance code), and Title 13 (Land Use – including designations to the register, design review and permitting, and demolition review). Establishment of a citywide demolition review process that would include review of demolition permits for adverse effects to historically significant buildings over 4,000 square feet, within Mixed Use Centers, and within National Register Historic Districts or affecting National Register listed buildings, as well as clarifying existing demolition review language in code. Amendments to clarify the nomination and designation process, including improvements to language regarding elements that can be included in historic designations, as well as improvements to the language regarding City Council review of nominations (TMC 13.07.050 and others). Changes to nomination requirements to ease nominations locally for properties already on the National Register of Historic Places. Increase effectiveness of Historic Conditional Use Permit by clarifying elements of listed properties eligible for Conditional Use, as well as potential expansion of use palette. In addition, there are a number of “clean up” items proposed for the historic preservation codes, including TMC 1.42 (which is outside of Title 13), including general language clean up (removing outdated references and revising language to be gender-neutral), removing the “arts commission liaison” position from the Commission – which has not been used for several years – and other minor changes. Proposed amendments have been accepted by the Planning Commission as a part of the 2018-19 Work Plan. The amendments are currently under review by the Landmarks Preservation Commission, which will make its recommendation to the Planning Commission in winter 2018. For more information on the Landmarks Preservation Commission agenda schedule, please visit www.cityoftacoma.org/lpc-agenda. These proposals are generally consistent with the policy guidance laid out in the 2011 Historic Preservation Comprehensive Plan Element, especially regarding demolition review. Get additional information regarding the Historic Preservation Plan, or visit the One Tacoma: Comprehensive Plan web page. For several years, potential amendments to certain aspects of historic preservation regulations, primarily the enhancement of the demolition review process, have been discussed in various venues, including at the Landmarks Commission meetings, council committees and other community groups. This year, updates to sections of the Land Use Code relating to historic preservation have been included in the Planning Commission 2018-19 amendment package.